Chords Maestro Free: 7 instruments, all major chords. Neonway updated ChordsMaestro Free on Feb.6, 2017. This is a free version of its most popular music app for OS X, and it contains all the major chords for 7 musical instruments.With no prior experience required, ChordsMaestro Free enables anyone to play and save chords for their favorite songs on piano, guitar, bass guitar, ukulele, mandolin and balalaika. The app is perfect for beginners, hobby musicians, music students, and fun to use for music lovers of all levels. Neonway, a mobile app development company based in Darmstadt, Germany, recently updated ChordsMaestro Free, a free version of its most popular music app for Mac OS X. With 7 musical instruments to choose from and all the major chords, this free app is perfect for beginners, hobby musicians, music students, and fun to use for music lovers of all levels. ChordsMaestro Free features seven musical instruments and allows users to play all the major chords in their favorite songs. They can select the way they prefer the chords to be displayed: notes, piano keys or fret board keys, for example. All the chords in the app come with pictures of the correct finger positions, both for right-handed and left-handed users. 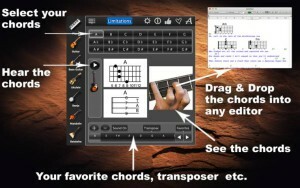 All seven instruments in the app are interconnected, so users are able to switch between instruments using the same chords, listen to the selected chords with authentic sound of their selected instrument; create, save and load the chords for their favorite songs and even transpose the chords to the key best suited for their voice range. ChordsMaestro Free is available worldwide through the Mac App Store in the Music category, free.